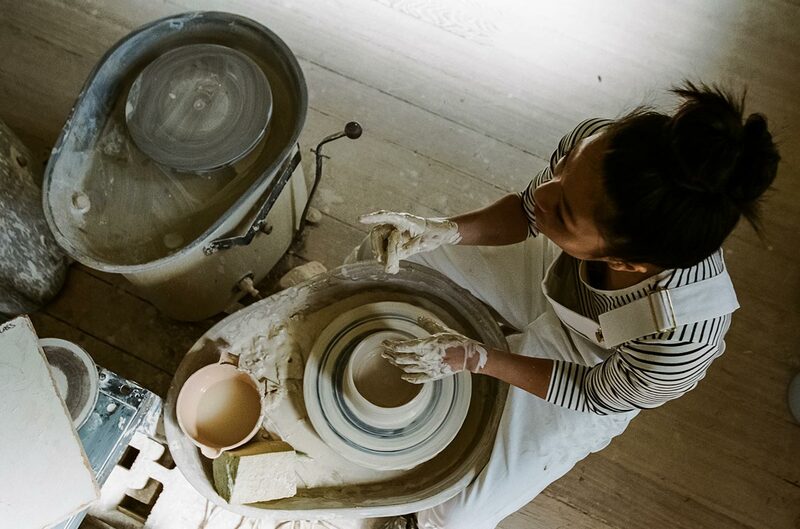 KIM CRUZ - THE POTTER X THE CLAY. 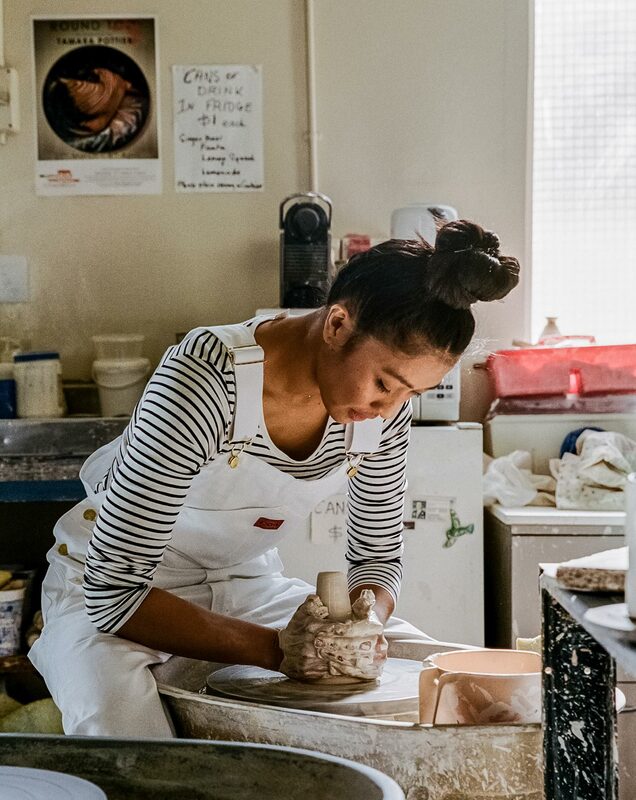 Meet Kimberly Cruz, a talented ceramic artist and founder of The Potter x The Clay. From planters to plates, Kim’s hand-crafted pieces have a touch of personality in each and every one of them. 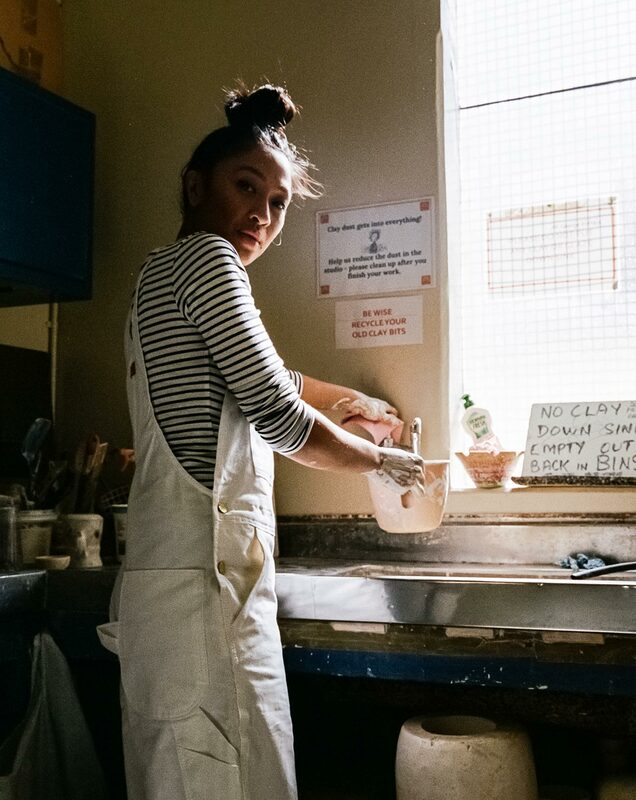 We chatted with her about her work and her creative world. Tell us about yourself, Kim. As first-generation immigrants, my family came to Australia when I was five. From the very beginning, I remember my parents working very hard, saving every dollar. My brothers and I never got an allowance, so from an early age, I’d sell anything I could get my hands on to earn my own pocket money. Vitamin C’s to school kids, toilet paper (in bulk) to their parents, magic tricks, fireworks, you name it. As I got older, my family developed a strong basketball community out in South-West Sydney. I grew up loving and playing the sport. Week in, week out I’d help teach kids clinics, train, coach and organise competitions – all under the umbrella ran by my familia. Looking back at everything now; all the things I was exposed to growing up had really prepared me for the right ethics for ceramics. It taught me the importance of hustle, heart, consistency and the higher order of serving your community. When did you get into pottery? My boyfriend had spent some time in New York, and he came back with a small ceramic piece, hand-built by the NY-based, Japanese artist Shino Takeda. As soon as I picked it up, something in me changed. There was a preciousness about it that had me feeling a particular type of way, and for a whole year I couldn’t shake it off. So, I enrolled in casual night classes. I’ve been a pig in mud ever since. Who/what has influenced your art over the years? I’ve always been outdoorsy and love hiking. The smell of wet dirt & moss after rain, the aches and pains of an uphill climb. So instinctively, I find my aesthetics drawing itself back to nature. Speckles, raw textures, tactile bumps and earthy glazes. Also women. I’m drawn to and inspired by strong, hard-working, smart women. My mother was my first female role model and has shown me the breadth & depth of what a woman can accomplish, especially in the face of adversity. In this age - the more we can advocate for each other, support and lift one another up, the bigger our opportunities to achieve much greater things will be. Tell us about your artistic process for a new collection or idea? It usually starts with a feeling I want to express. I’ve always kept a journal since I was 8, so I’m continually scribbling, documenting thoughts and memories, or jotting down verses or poetry that inspires me. I feel like my best work is born from times I’ve felt hurt, been frustrated or extremely vulnerable. I try to embed as much feeling and energy into the clay, so there’s almost a ‘felt sense’ when others pick it up. Can you shed any light on upcoming projects? For the past two months, I’ve been working late into the night to build a collection for my first market stall in two years. It’s on October 27 - I can’t share many details yet, but please stay tuned on my Instagram for more updates. My body is exhausted, and I’m pretty nervous and anxious about it. It’s like putting your whole heart out there for one day, and I’ve got constant fears of not selling anything. What is your go-to Dickies garment? 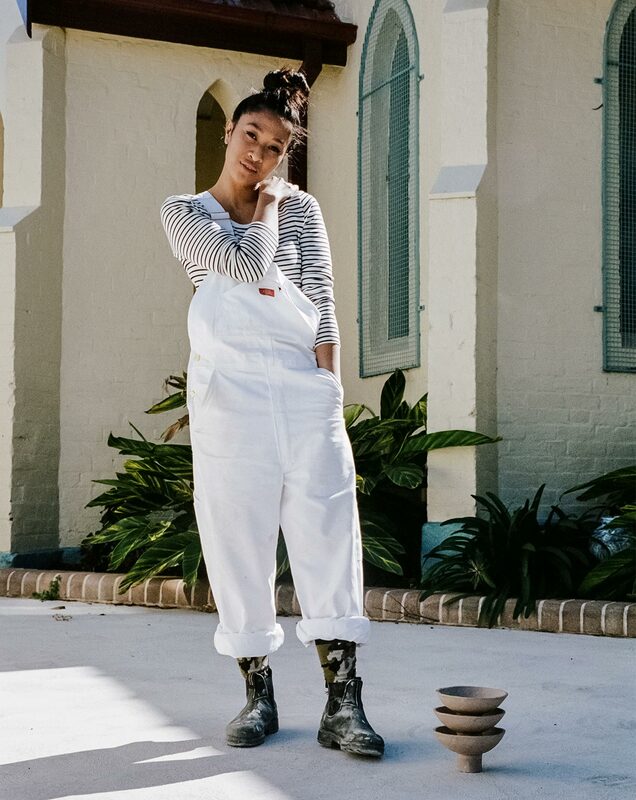 Definitely the (8953) Painters Overalls and the Men's 874 pants. Whenever I have coffee somewhere else, I always compare it to Barmuda’s. It’s got that deliciously strong kick without the bitterness. They also do the meanest, best hot chocolate you will ever have. Best Vietnamese - Mother Yen. A humble family biz that’s only been around a year, but their sincere hospitality and grilled lemongrass pork, rice & egg brings a strong sense of nostalgia for me growing up and eating ‘out-west’. Best Wood-fired Pizza – Not giving that one away. It’s hard enough to get a table as it is already and I’m still trying to work myself up to a first-name basis, so I’m keeping this one to myself… Psyke! Look: Kim is wearing the 8953 Painters Overalls.